Question: May one mash a banana or avocado on Shabbat using a fork? Answer: In the previous Halachot we have established that it is forbidden to grind on Shabbat. Included in the prohibition of grinding on Shabbat is slicing a vegetable very finely on Shabbat, as the Rambam (Chapter 7 of Hilchot Shabbat) states, “One who grinds takes one piece and splits it into many pieces.” There is only room for leniency to slice a vegetable finely when it will be eaten within a half-hour of the slicing. Let us now discuss mashing a banana on Shabbat using a fork. Clearly, mashing is quite similar to grinding and it is therefore forbidden to mash a banana in order to eat it (or feed it to a baby) in an hour or two. What is left to discuss is whether or not it is permissible to mash a banana when one intends to eat it immediately. Nevertheless, based on what we have learned that according to Maran Ha’Shulchan Aruch and the Rama (based on the ruling of the Rashba) that one may cut up a salad on Shabbat as long as one intends to eat it immediately, the same would apply to mashing a banana with a fork, for mashing is tantamount to slicing very finely and as long as one intends to eat the food immediately, it is permissible to do so on Shabbat. On the other hand, after delving into this matter lengthily, Hagaon Chazon Ish disagrees with the Poskim who rule leniently on this matter when one plans on eating it immediately and rules that there is only room for leniency when one mashes the banana with a variation, i.e. using the handle of a knife (as we have discussed regarding the actual grinding of spices). He adds that one who mashes a banana on Shabbat with the prongs of a fork is obligated to bring a “Chatat” offering and is liable for Shabbat desecration. 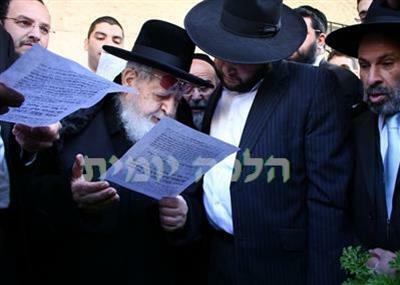 Maran Rabbeinu Ovadia Yosef zt”l writes lengthily to rebuff the opinion of the Chazon Ish and vehemently defends the rulings of the Rashba and other great Poskim. He writes that that there is no reason at all to be concerned about the Chazon Ish’s ruling regarding this issue, for it stands in opposition of the opinions of the Shulchan Aruch and its commentaries. He proceeds to support his opinion with sources. Indeed, Hagaon Harav Moshe Feinstein zt”l and Hagaon Harav Ben-Zion Abba Shaul zt”l (Responsa Ohr Le’Zion, Volume 1, Chapter 28) among others, rule likewise. Thus, halachically speaking, one may mash a banana or avocado on Shabbat using a fork in order to eat it immediately. However, it is forbidden to mash them using a machine or utensil designated for mashing (see Responsa Yechave Da’at, Volume 5, Chapter 27 and Chazon Ovadia-Shabbat, Part 4, page 255).